Thunderstorm potential returns to SEQLD/NENSW tomorrow and Thursday as a trough/front move through our region. Storms most likely affecting NENSW and parts of inland SEQLD tomorrow / overnight into Thursday, with those chances progressively shifting northward and through the remainder of SEQLD on Thursday. There may be locally heavy falls associated with the storm activity, probably favouring areas on and west of the ranges, but some lucky coastal locations might also benefit if they find themselves in the right place. (Some discussion has already occurred in the day-to-day thread). Strong trough forecast to move through tomorrow & thursday with a rainband & embedded gusty storms. EC showing a good amount of dust following the stormy rain thurs into friday. Good looking line already building on 512k Stapy. Anyone suggest the timing when the rainband/storms comes through, afternoon or night time? Excellent. Thursday looks particularly interesting for here. Might be some pre frontal thunderstorms on the Darling Downs late tomorrow afternoon. The straight line winds through height and from other similar setups I've seen maybe squall line setup but the forecast precip shows numerous bands not sure exactly in what form. It's been mentioned the winds aloft are pushing 40-50kt NW'lys. On the other hand I'm looking at the instability and TTs and nothing is really sticking out but the lapse rates look great. Glad to be at home for this one. That dust behind it is interesting. From my untrained eye looks like tomorrow arvos storms potentially continuing through the night and into Thursday morning with storms/associated rainband clearing the coast by Thursday PM. EC and ACCESS-C currently have the leading edge reaching western and southern parts of the Downs and Northern Tablelands during the middle of the day tomorrow, spreading to inland parts of SE QLD late afternoon or early evening, then the majority of the activity reaching the coast overnight, peaking around Thursday morning, before progressively clearing out to sea during the middle of the day or early afternoon. But there's always the chance the timings could be a bit earlier than expected though given the strong WNW (initially) steering winds (for storms) aloft. The timing isn't ideal for widespread severe storms around the coast and it could be a bit of an embedded rainy cloudy mess as Mezo mentioned but couldn't rule out the chance of severes either given the shear. Winds should become pretty gusty as well and linger for a number of days... this will probably lead to increasing fire dangers after things start drying out a bit post-rain. Thanks for the thread for this event and for the great guidance starting to come through. This looks like a rainy mess to me with an outside chance of a squall line. Hard to get excited about this. Are there any chances we might see a dust storm out of this or will that be ruined by the rain on the leading edge of the front? Cool graph Ken very clear to the eye. 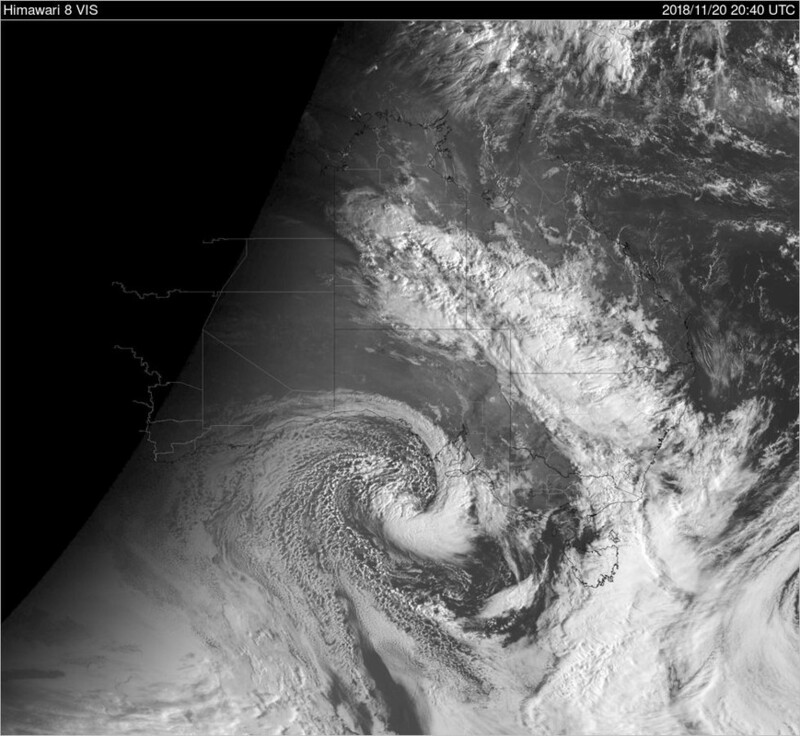 Thanks for the input Ken.On another note , all these projected massive Lows in the Tasman , What's going on its November? Just assuming that the current EC forecast is accurate (there could be changes in timing/thickness between now and then), the dust concentrations would fall into either the 'Moderate' or 'Severe' Dust Haze range, depending on where you are. NENSW and inland SEQLD getting thickest concentrations mostly between 60 and 110µg/m3 on Thursday (out St George way, getting up to around 160-170µg/m3 in the morning). 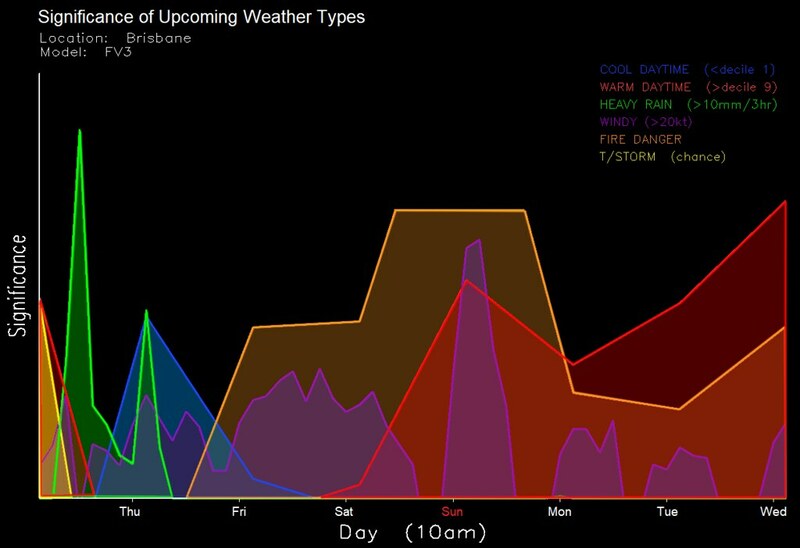 The thickest of the dust moves through Thursday night / early Friday in the Brisbane area with concentrations around 50-80µg/m3. 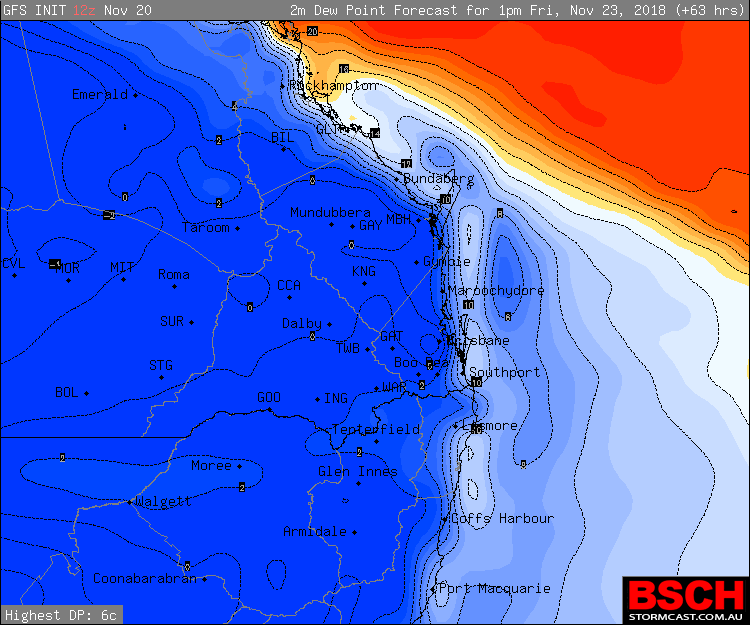 By sunrise on Friday, the thickest is around Hervey Bay area with concentrations around 25-45µg/m3. What severity was the 2009 dust storm that hit the east coast? Severe dust storm. I guess the wait for another good dust storm continues. From wikipedia article visibility got down to 100m Ipswich and Toowoomba 200m in brisbane (borderline severe/moderate) and 500m on Gold Coast. 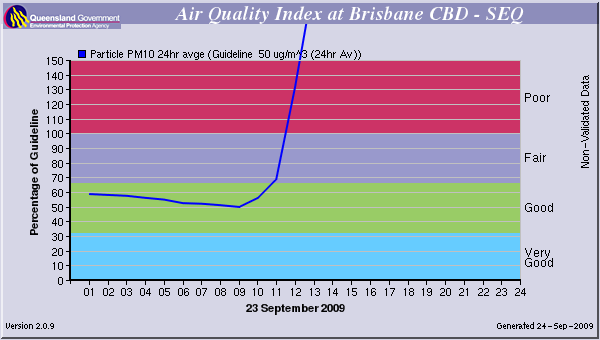 Below is a graph of the concentration of PM10 particles (reasonably coarse particles with a diameter of 10 micrometres or less) that was measured in Brisbane as the dust reached the city in 2009. The dust scheme in CAMS displayed in ECMWF products currently also hints at the possibility of some additional dust haze reaching the coast on Sunday with the very strong WSW'lies blowing over the inland with the next system. But dust does also depend on rainfall as well (if significant rainfall falls on areas before strong winds or gusty thunderstorms have a chance to blow over that area, there won't be as much dust... but if the strong winds come before any rainfall, the chance of dust increases). This afternoon: The first band marches across the Downs and Northern Tablelands, and approaches inland and southern SE QLD later this afternoon (EC's a bit slower). This evening: This activity shifts across parts of SE QLD and the NE NSW coast but in a weakening state. Thursday morning: Another lot of activity in a NW/SE band forms over the Downs early morning before spreading to parts of the SE QLD/NE NSW coast (EC has the heavier precip a bit further north and doesn't intensify it as much over the Downs). Thursday afternoon: The band progressively contracts NE and clears most of SE QLD by late afternoon. So in other words, not necessarily continuous but possibly in the form of a couple of peaks. Would it be possible for you to do a wind script for fri/sat/sun when you have a chance please. Toowoomba range area would be great. I'm not sure I've seen anything like this for this time of year. Models just have one big low after another steaming across southern Australia with westerly winds dominating up here and no opportunity for any moisture build ahead of any of the fronts connected to them after the first one on Thursday. Just...WTF. And yes Kev, the AAO surprisingly being neutral just adds to the mystery even more. Rain turns to mud as localised dust storms hit regional NSW ahead of larger system today. 4 registered (petethemoskeet, Adaminaby Angler, crikey, Dan101), 58 Guests and 3 Spiders online.